Major General William C. Lee, Dunn, North Carolina’s famous airborne hero, was a North Carolina State University ROTC graduate who stayed in the Army after World War I, and was assigned as a peace-time observer in Germany. In this position Lee took note of Hitler’s development of his airborne troops. Lee returned to Washington as a Major in the Office of the Chief of Infantry. 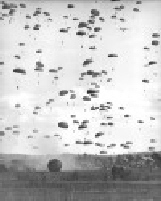 He was still infatuated by what he had seen the German Army doing with its airborne forces. The gentleman on the phone was President Franklin Roosevelt’s military aide. He told Lee the President had been reading about Hitler’s airborne activities and wanted to know more about it. Major Lee was invited to the White House to brief President Roosevelt on what he had seen in Germany. The President was so impressed that he ordered airborne planning and training to begin immediately. Lee had seen a parachute drop at the World’s Fair in New York that lifted customers by pulley and dropped them to the ground by parachute. He ordered two of the lift towers erected at the parachute school at Fort Benning, Georgia, where they are still being used. This was the beginning of America’s airborne forces, which were credited a short time later in shortening World War II by years and saving countless lives. "The 101st has no history, but it has a rendezvous with destiny."